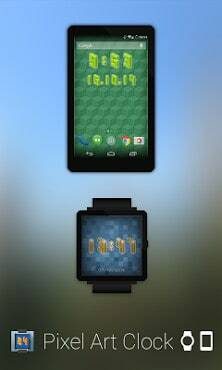 Pixel Art Clock is a date and time widget for your Android home screen and a cool watchface for your Android Wear. Infinite differents combinations of customization. Long press on any empty space on your home screen. 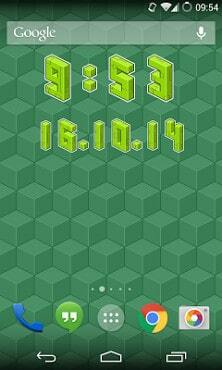 Click on the widget menu then select Pixel Art Clock widget, this will place your widget on your Android home screen. In ICS (or later) touch the All Apps icon of the Home screen. Touch Widgets at the top of the screen. Touch and hold the widget’s icon, then position the widget on the home screen, then release. If you are experiencing problems with the widget after an update from an older version, please uninstall the application, restart your phone and reinstall Pixel Art Clock. Everything should work perfectly.